I will be away from my computer for the next few days, but will post some passing thoughts, as I view our changing world. I know I should probably just announce a brief "break", but it's hard not to stay in contact with all of you. So, please excuse the shorter dialogue and I'll be back in full swing at the end of the week. Then, if you observed the blood red moon from West Africa, you might have seen a connection between its appearance and the rapidly spreading ebola virus. Having moved from the jungle to a densely-populated urban area in Conakry, the capital of Guinea, this deadly virus has the potential to spread worldwide. Passengers are being screened at airports in an attempt to keep the virus from becoming a global epidemic. With the death toll rising, let's pray that health officials can accomplish this task. Droughts in California mean less fruits and vegetables for market and higher prices; while droughts in Texas are doing the same thing for the price of beef. When you can't feed your cattle, they usually end up at the slaughterhouse, which results in fewer calves being born, and eventually less beef at the grocery store. All this results in the highest price for beef in almost three decades. Hmmm, disease and higher costs for food .... does "A quart of wheat for a denarius" (that would be a whole day's pay) take on new significance? 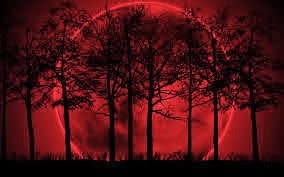 And is it coincidence that we are seeing only the third series of blood red moons in nearly 500 years? I know I keep harping on the possibility that the headlines of our day are showing us moving towards prophetic, Biblical events. But I do not want you to dismiss these seemingly chance occurrences. They are happening simultaneously and sure feel to me like they are leading up to something BIG! If you've never opened your Bible, I urge you to take a look at the Book of Revelation. And if you do read your Bible, take a closer look at this prophetic book. Yes, I know it is the most difficult Scripture in the entire Bible, but for those who will hear and see, I think it will make our daily headlines come into clear focus. The blood red moon may be gone until later in the year; September to be exact, but keep your eyes aimed at the heavens. Revelation 6:8 "So I looked, and behold, a pale horse. And the name of him who sat on it was Death, and Hades followed with him. And power was given to them over a fourth of the earth, to kill with sword, with hunger, with death, and by the beasts of the earth."